How well companies manage their social presence. The company’s ability to respond to customer feedback. How active their audience is in relation to their social media activities. A powerhouse of the industry ranking 11th overall, EA has a substantial social footprint having over 74 million searches in October of 2017 (SimilarWeb, 2017). The company operates many different online entry points including; YouTube, Facebook, Twitter, and Reddit. Which equate to almost 6% of all their social media traffic. The one good thing that can be said about EA is they handle their presence very well. Like a lot of companies in the market, EA works alongside social media idols to reach other markets just look at Fifa YouTubers. In doing this EA creates other platforms from which to promote themselves and their products, reaching new audiences through these YouTubers. Slightly smaller than EA but still a market pioneer in their own right Bungie rank 38th in the industry. In the October period, Bungie received around 30 million searches on their website, (SimilarWeb, 2017) similarly to EA Bungie maintain many different online entry points in the shape of Reddit, Twitter, Facebook, and YouTube. The main difference here is that Bungie has higher overall social traffic at 7.06% with the main entry point being Reddit rather than EA’s YouTube. Entry points are important as they say a lot about how the industry connects with its audience. 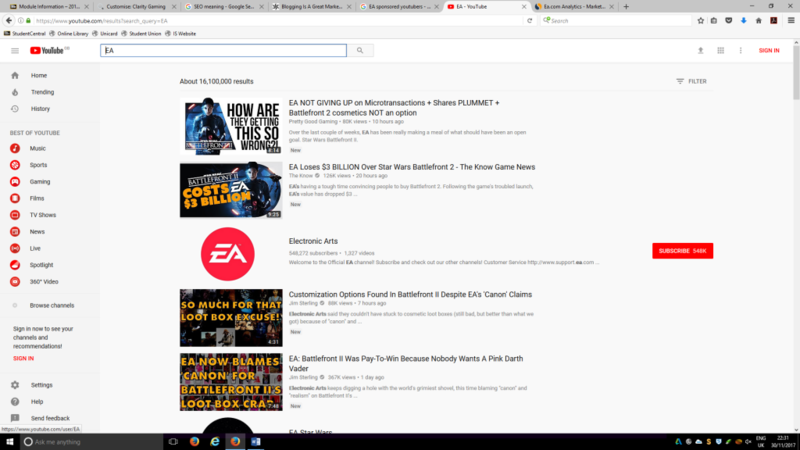 As state before EA’s social traffic mainly comes for YouTube, so I went on to YouTube Typed EA in the Search bar and found that of the first 10 videos to come 7 have an adverse effect on EA’s Brand Image. The issue with this is that YouTube videos offer little opportunity to get ahead of the negative comments and address them. They essentially act as a one way street for information, if they’re positively promoting the brand image then perfect, but when the message is negative that is the only information that the audience will receive and this affects the brand negatively. 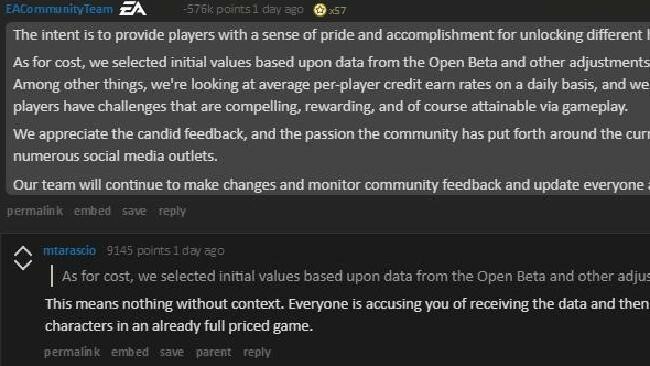 Recently EA has been having a tough time with the release of their new game and has had a large amount of backlash from the community, and in EA’s defense they took a smart approach and chose to post their reply to the backlash on Reddit. As a platform, Reddit is far more suited to deal with negativity as there’s more open discussion between audience and company. However, EA’s issue here is that they simply didn’t listen to their audience. The reply above was EA’s response to backlash concerning microtransactions in the newly released Starwars Battlefront 2. However, rather than addressing the concerns of the audience EA released a response that many people in the community took as an excuse or justification of why their concerns were not being addressed and naturally caused a further backlash in the form of a loss of stock, predicting is setting the loss at $3.1 billion. Bungie has always had an ok relationship with their audience, largely because of the way that they use their online entry points, Reddit in particular. Bungie has a much larger audience focus than their EA counterparts, going further to control the narrative of their brand image. This week fans of Destiny 2 (a Bungie title) were furious with a scandal that arose from the game. So what did Bungie do? They put their hands up and apologized for doing so the company posted a detailed lengthy blog on their website detailing the issues and how the planned on fixing them. This level of transparency and honesty in the face of negativity is how you protect your brand image and keep the audience on side. The games industry requires efficient social media management the examples I have given show that even the industry leaders can get this wrong. Simply putting out content isn’t enough companies need to manage how that content is received by their audience as well. In the future companies should ensure they follow guidelines such as the 10 laws of social media. reddit. (2017). /r/StarWarsBattlefront. [online] Available at: https://www.reddit.com/r/StarWarsBattlefront/ [Accessed 1 Dec. 2017]. SimilarWeb. (2017). bungie.net Traffic Statistics. [online] Available at: https://www.similarweb.com/website/bungie.net#overview [Accessed 1 Dec. 2017]. SimilarWeb. (2017). ea.com Traffic Statistics. [online] Available at: https://www.similarweb.com/website/ea.com#overview [Accessed 1 Dec. 2017]. YouTube. (2017). 10 Laws of Social Media Marketing. [online] Available at: https://www.youtube.com/watch?v=–s2sfm9JkI [Accessed 1 Dec. 2017]. Youtube.com. (2017). EA – YouTube. [online] Available at: https://www.youtube.com/results?search_query=EA [Accessed 1 Dec. 2017].